10 Silver Plated memory wire ends. Approx 3mm one hole (these are half drilled beads). Glue these on..
Copper Jewellery Wire Flat strip 0.75 x 3mm 1 coil of 1 metre. ..
Copper Jewellery Wire 0.4mm (26 Gauge) 1 coil of 20 metres. ..
Copper Jewellery Wire - 1.25mm (16 Gauge); 1 coil of 3 metres. ..
Silver Plated Copper Jewellery Wire - 1.25mm (16 Gauge); 1 coil of 3 metres. ..
Gold Plated Copper Jewellery Wire 0.4mm (26 Gauge) 1 coil of 15 metres. ..
Silver Plated economy jewellery wire 0.5mm (24 Gauge) 1 coil of 12 metres. .. Coil Brass jewellery wire, 1.0mm diameter 4 metres long, made from solid brass. .. Coil Brass jewellery wire, 0.6mm diameter 10 metres long, made from solid brass. ..
Gold Plated Copper Jewellery Wire 1.0mm (18 Gauge) 1 coil of 4 metres. ..
Copper Jewellery Wire 0.8mm (20 Gauge) 1 coil of 6 metres. This copper wire has been silver plated t..
1/2 metre of 1.0mm (0.039in) Sterling Silver wire annealed soft.Sterling Silver is 92.5% silver, the..
Copper Jewellery Wire 1mm (18 Gauge) 1 coil of 4 metres. 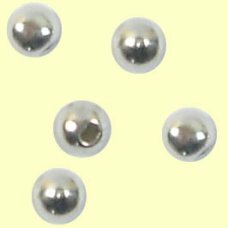 ..
Spool Silver Plated Copper Jewellery Wire 0.2mm. 125metres supplied on a spool. ..
Copper Jewellery Wire 0.6mm (22 Gauge) 1 coil of 10 metres. ..
Approx 195 coils of Stainless steel memory wire 0.62mm (0.025) wire (1oz). Coils 1.9 to 2..
Silver Plated Copper Copper Jewellery Wire 0.8mm (20 Gauge) 1 coil of 6 metres. ..
Gold Plated, Copper Jewellery Wire - 0.8mm (20 gauge); coil of 6 metres. ..
Silver Plated Copper Jewellery Wire 0.5mm (24 Gauge) 1 coil of 15 metres. ..
Gold Plated Copper Jewellery Wire 1.5mm (14 Gauge) 1 coil of 1.75 metres. ..
One 1oz coil will make many necklaces approx 36 coils of Stainless steel memory wire 0.62..
Spool goldtone copper jewellery wire 0.3mm (28 gauge) enamelled tarnish resistant copper wire this i..
One 1oz coil will make many many bracelets. approx 60 coils of Stainless steel memory wir..
Spool Copper Jewellery Wire 0.3mm (28 gauge) enamelled tarnish resistant copper wire this is the lig..
Copper Jewellery Wire 1mm (18 Gauge) 1 coil of 4 metres. This copper wire has been silver plated the..
1 metre of 0.5mm (0.02 24ga) Sterling Silver wire this is my favourite sized wire and the stuff I us..
Goldtone Copper Jewellery Wire 0.6mm (22 Gauge) 1 coil of 10 metres. This copper wire has been silve..
1/2 metre of 0.8mm (0.032in) Sterling Silver wire annealed soft. Sterling Silver is 92.5% silver, t..
Copper Jewellery Wire 0.8mm (20 Gauge) 1 coil of 6 metres. ..
Silver Plated Copper Jewellery Wire 1mm (18 Gauge) 1 coil of 4 metres. ..
30 coils of Stainless steel memory wire 0.62mm (0.025) wire. Finger ring size also useful..
Silver Plated Copper Jewellery Wire 0.6mm (22 Gauge) 1 coil of 10 metres. ..
1 Coil 1.75 metre 1.5mm copper jewellery wire. ..
Silver Plated, Copper Jewellery Wire - 1.5mm (14 Gauge); 1 coil of 1.75 metres. Enamelled tarnish re..
Spool Silver Plated Copper Jewellery Wire 0.5mm (24 gauge) enamelled tarnish resistant copper wire 1..
6 coils of Stainless steel memory wire 0.62mm (0.025) wire. Coil 9.2 to 10.2cm diame..
Spool Silver Plated Copper Copper Jewellery Wire 0.3mm (28 gauge) enamelled tarnish resistant c..
12 coils of bright Stainless steel memory wire 0.62mm (0.025) wire. Coils 5.7 to 6.7cm diameter..
Gold Plated CopperCopper Jewellery Wire 0.6mm (22 Gauge) 1 coil of 10 metres. ..
GF-65, 1 Metre Gold Filled Wire 28g, 0.3mm. 1 Metre Gold Filled Wire 0.3mm (28ga) soft. Sold off the spool in continuous lengths. ..
10 Gold Plated Memory Wire Ends Gold or silver plating over base metal give the look and feel sim..
Spool 20 metres of 0.5mm (24 gauge) Vanilla coloured copper jewellery wire. ..
Spool 50 metres of 0.3mm (28 gauge) Vanilla coloured copper jewellery wire. ..
Spool 20 metres of 0.5mm (24 gauge) Champagne coloured copper jewellery wire. ..
Spool 50 metres of 0.3mm (28 gauge) Champagne coloured copper jewellery wire. ..
Spool 20 metres of 0.5mm (24 gauge) Green coloured copper jewellery wire. .. Coil Forest Green Silk Covered Aluminium Wire 0.9mm ..
1 Coil 5 metres lime green 0.9mm copper jewellery wire ..